Wrap your little boy up and give them a cuddle in our super stylish cuddly fleece hooded dressing gowns! 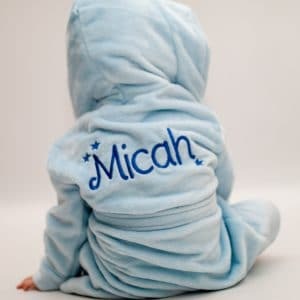 The robe is a perfect gift and keepsake from newborns to big kids. To personalise, simply add your little man's name to the text box below! 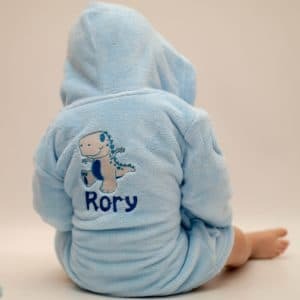 Wrap your little boy up and give them a cuddle in our super stylish cuddly fleece hooded dressing gowns! The robe is a perfect gift and keepsake from newborns to big kids. To personalise alongside our dinosaur design, simply add your little man's name into the personalisation box below! Every little one needs a fluffy dressing gown, so so snuggly. Wrap your baby boy or baby girl up to be as cute as a button in our gorgeous thick and fluffy fleece style robe! The robe is a perfect gift and keepsake from newborns to big kids! Wrap your little girl up and give them a cuddle in our super stylish cuddly fleece hooded dressing gowns! The robe is a perfect gift and keepsake from newborns to big kids. To personalise, simply enter your little one's name in the text box below! Wrap your little girl up and give them a cuddle in our super stylish cuddly Personalised Pink Dressing Gown! 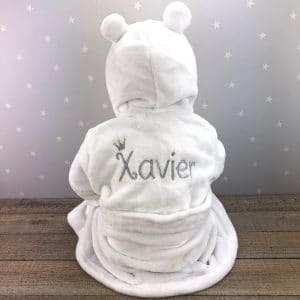 This robe is a perfect gift and keepsake from newborns to big kids and includes our exclusive unicorn design alongside your Princess' name. To personalise, simply add your girl's name to the personalisation box below! 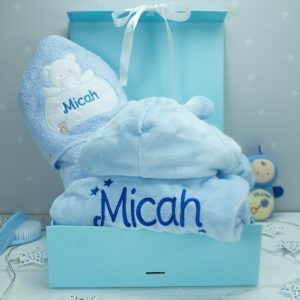 Take the stress of baby's bath time away with our adorable Bath Time Gift set, that includes a Personalised Hooded Towel to keep him dry, a Personalised Dressing Gown to keep him super cosy & Personalised Baby Gift Box! Every little one needs a fluffy dressing gown, so so snuggly that is accompanied with adorable ears on the hood. 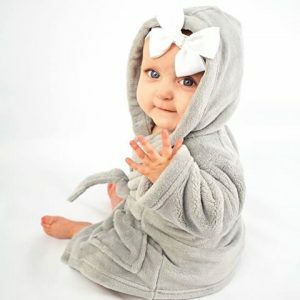 Wrap your baby boy or baby girl up to be as cute as a button in our gorgeous thick and fluffy fleece style robe! The robe is a perfect gift and keepsake from newborns to big kids! Take the stress of baby's bath time away with our adorable Bath Time Gift set, that includes a Personalised Hooded Towel to keep them dry, a Personalised Dressing Gown to keep them super cosy & Personalised Baby Gift Box!